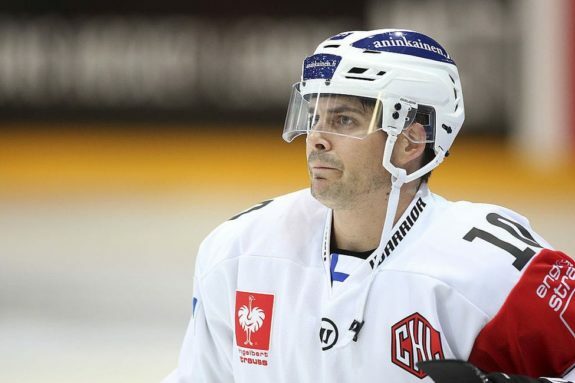 43-year-old Stanley Cup winner Éric Perrin finished off his remarkable career in Finland last week. He now holds the records for most games played and most points scored by any foreign player in the league’s history. The Hockey Writers took a closer look at how Perrin’s career path unfolded overseas. A lot has happened since 2004, when Perrin hoisted the Stanley Cup at St. Pete Times Forum with the Tampa Bay Lightning. Playing alongside his childhood friend Martin St. Louis, Perrin skated in 12 playoff games in his debut season after appearing in only four regular season clashes beforehand. Despite getting a taste of the ultimate price very early on in his NHL career, his time in the league was quite short-lived in the end. Following Tampa’s historic Cup run, Perrin spent the 2004–05 lockout season with the Hershey Bears and looked for another shot at the NHL over in Switzerland a year later. He managed to make a comeback for the 2006–07 campaign – again with the Lightning – and played a full 82-game regular season this time. Perrin’s last two seasons in the NHL were spent with the Atlanta Thrashers, after which he began his third stint on European ice. Martin St. Louis followed his best friend’s journey in Europe with enthusiasm. Before joining the Lightning for the first time, Perrin had already played three seasons in the Finnish league with great success. However, with his status, a step directly back to Finland seemed way too early at this point. Therefore, he opted for the KHL and Avangard Omsk. A mediocre 2009–10 season saw him put up less points than he’d hoped and once again it was time to re-evaluate his future. Now at 34, Perrin felt that the time was finally right for his return to Finland. He joined JYP, the team in Jyväskylä that launched him into the NHL back in 2003. Neither the team nor Perrin himself had any idea that this was going to be one of the greatest stories in Finnish hockey history. In his first two seasons, he arrived with bang, scoring almost exactly a point a game in a dominant JYP team featuring the likes of Sami Vatanen and Yohann Auvitu. The 2012 Finnish league playoffs were a one-team show. JYP cruised to victory with only two losses in three series and Perrin clinched the championship with an overtime goal in Game 5. At the time, some thought this was the end of his impressive career. A 36-year-old family man, scoring in overtime to give JYP it’s second ever Finnish championship – surely that had to be the perfect ending, right? Perrin didn’t think so. Instead, he became the team captain and continued to dominate the league like he was in his 20s. Three more seasons with JYP produced even more magical numbers and at this point many began wondering if the “Laval Lion” was ever going to retire. Then became a surprising turning point. Perrin fell out with JYP’s long-time head coach Marko Virtanen and looked for a new opportunity in an already experienced TPS team in Turku. Veterans like Henrik Tallinder, Mark Fraser, Petteri Nummelin and Tomi Kallio showed that with the addition of Perrin, TPS was ready to win right there and then. Unfortunately, the team’s goaltending was an issue for most of Perrin’s three seasons in the southwest, despite young Alexandar Georgiyev doing his best as a rather solid backup. This led to an underwhelming end to what could have been the perfect story for Perrin in TPS. Still, he was once again one of the team’s leading scorers and only got better as time went on. Breaking his personal goal-scoring record at 42 years of age, there was no way he was letting the team’s disappointing performance become his last chapter as a hockey player. He packed his bags and headed back to Jyväskylä one last time, as JYP, in turn, had put together their version of a perfect veteran-filled roster for 2018–19. Perrin was a beloved character in Jyväskylä. Five of JYP’s players were even older than the head coach himself, which in the end proved to be a bad decision by the club’s management. Despite being knocked out in the first round of the playoffs, Perrin showed his class once more by notching his 607th point in Finland only 13 seconds before his career was officially over. A record-breaking career truly got a worthy ending.